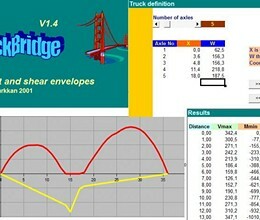 * quickBridge download link provides freeware version of the software. 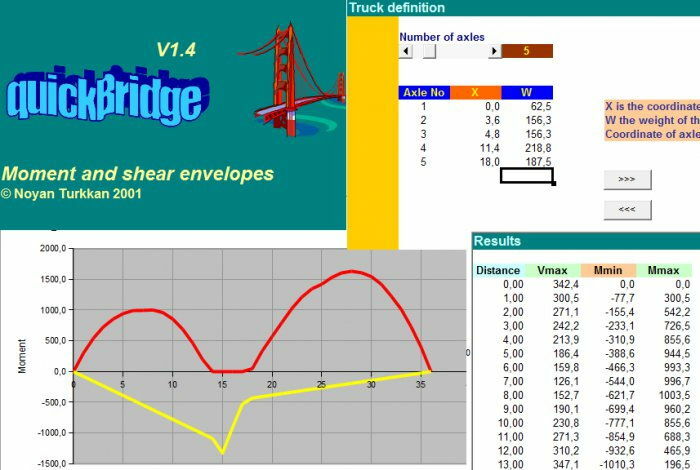 Builds two-dimensional bridge models and performs static and moving load analyzes. Uses GT STRUDL as a structural analysis engine. MOVLOADS is a spreadsheet program written in MS-Excel for the purpose of analysis of simple-span members subjected to from one up to eight moving wheel loads with up to seven wheel spacings. Abnormal Load Vehicles, HB Vehicles, BD21 Annex D Vehicles and BD86 STGO Vehicles are analysed as moving loads across a single or multi-span continuous line beam to determine critical bending moments and shear forces. The simplest and versatile software for structural analysis and design of bridges with super structures, sub structures, foundations, hydrological analysis, culverts, underpasses. quickBridge has been rated 5.0 out of 5 points. A total of 2 votes cast and 0 users reviewed the software.